Study finds more than 2/3 of guidelines don’t adequately explain risks, benefits. Researchers from the University of Michigan Health System examined 55 professional guideline recommendations for cancer screening or prevention. They found 69 percent did not quantify and present benefits and harms in comparable terms. “Almost all medical interventions have tradeoffs between different types of benefits and harms,” says Tanner J. Caverly, M.D., clinical lecturer of internal medicine and of learning health sciences and a research investigator at the VA Ann Arbor Healthcare System Center for Clinical Management Research. The study, published in the Journal of the National Cancer Institute, looked at guidelines such as mammography screening for breast cancer, PSA testing for prostate cancer, colonoscopy for colon cancer, HPV vaccination for cervical cancer and other screening tests. Guidelines were from agencies such as the U.S. Preventive Services Task Force, the American Cancer Society and the National Comprehensive Cancer Network. 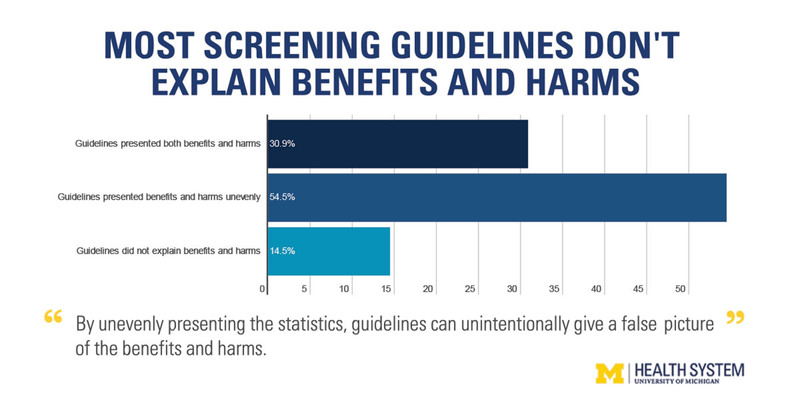 The researchers found that 31 percent of guidelines recommending screening presented absolute effects for both benefits and harms. Meanwhile, 55 percent presented the tradeoffs unevenly, explaining the benefit but not the harm or presenting the numbers in different ways. For example, some studies used relative risk reduction, often a larger number, to show benefit — people who were screened were twice as likely to survive. But they used absolute risk, often a much smaller number, to demonstrate harm — 1 percent of people screened had a false diagnosis. “By unevenly presenting the statistics, guidelines can unintentionally give a false picture of the benefits and harms. The relative risk of 'twice as likely' sounds significant, but in terms of absolute risk it might represent a very small difference,” said senior author Angela Fagerlin, Ph.D., professor and chair at the University of Utah’s Department of Population Health Sciences and a research scientist at the Salt Lake City VA.